We hope to see you in one of our classes! At B+B Studio, we believe in doing what you love, pursuing your passion and living your best life. We believe that making a commitment to your health will change your life for the better. We believe that in making your body strong, your mind and will also become more powerful. We believe that you deserve the best and are committed to delivering our best to you in every session, every contact with us. We believe in grace, in laughter, in joyful moments. We believe that happiness is a choice. — and we love it. We believe that fitness can be fun and that age is just a number. Nestled behind frosted doors with no signs, B+B Studio has been labeled as “MANILA’S BEST KEPT SECRET” by the American Women’s Club of the Philippines and voted “BEST STUDIO” by the Philippine Tatler. B+B Studio has rarely advertised, yet clients find it. B+B’s clientele belong to Manila’s crème dela crème who want nothing but the best. 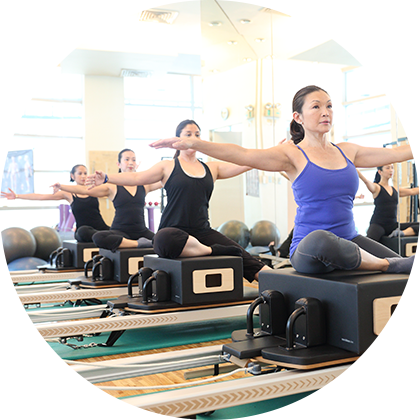 B+B Studio originally began by offering only private STOTT PILATES® classes. Today, its repertoire has expanded to related fields like Redcord Active Suspension Training, Total Barre™, ZEN•GA™, Cardio+Core, Piloxing and other programs. Come over and be challenged and motivated in a safe and encouraging environment. B+B Studio is your best partner in total body fitness. We are committed to your well-being. Pilates is effective for anyone at any stage—whether you’re the CEO of a company, a rising internet entrepreneur, an ambitious young professional or a new mom. Its focus on mind-body alignment and building your core strength will support you in your daily activities and in helping you achieve your goals. Whether you’re an athlete or a sedentary individual, 9 years old or 99, B+B Studio will create a Pilates program to suit your exacting needs. The foundation of Pilates is your core strength. Your core muscles are the deep, internal muscles of your abdomen, pelvic floor, diaphragm and back. By developing these muscles, you will feel more stability in your torso which allows you to move with more ease and efficiency, and feel free from pain. Pilates is an exercise system developed by Joseph Pilates that focuses on core strength, flexibility and awareness to help you move more gracefully and efficiently. By lengthening and stretching your whole body, your balance, muscle strength, posture and flexibility will all be improved. You become longer, leaner and stronger—and any back, neck or joint pain will be decreased. Sign up now to find out our new classes, events and more.